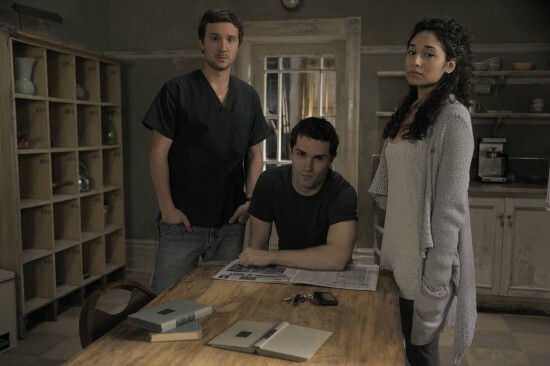 I started watching the US version of Being Human on the SyFy network about the same time I took crocheting back up. My enjoyment of this show about three roommates in Boston, one a vampire, one a werewolf and the third, Sally, a ghost, took on a whole new level (let’s quietly call it an obsession) when I decided I would figure out how to crochet Sally’s sweater. It’s a very casual sweater and looks very comfy and cozy. However, it, thus far in my searches, appears to be one-of-a-kind. I have searched high and low for another like it, even asking various boards (Ravelry is a wonderful thing!) if anyone knew of a pattern. There are several *close* look alikes, but none are the real deal. 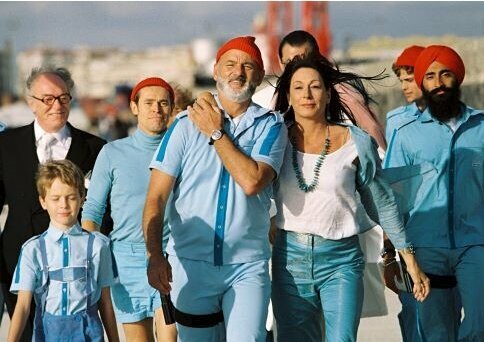 So, it has become my latest moral imperative to recreate this sweater. I end up having to watch each new episode of Being Human several times because I will go through an entire scene and realize I’ve not heard a single word of dialogue focusing on the stitches in Sally’s sweater. Sandy simply says, “You’re hooked.” (pun intended?) or “Yeah, you’ve got it bad.” but, this is a case of exactly why we started this blog. 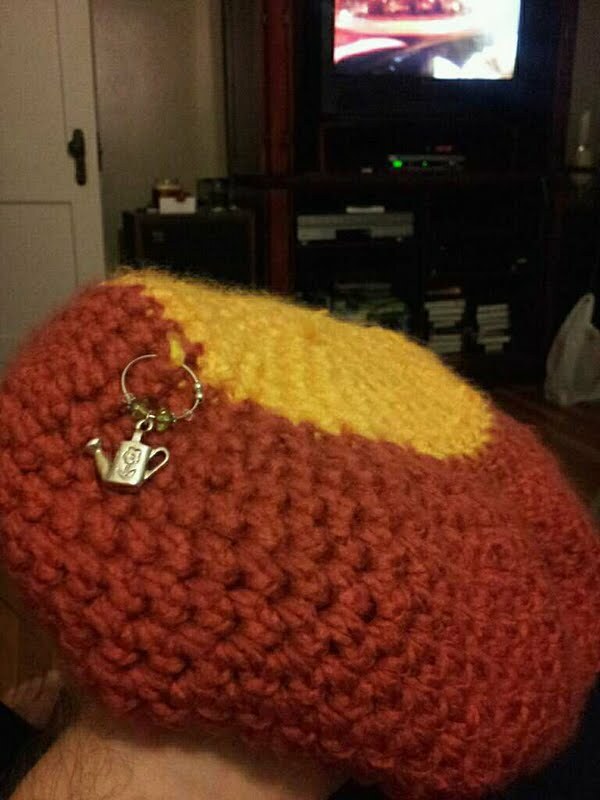 Combining our love of both fan/geekdoms and yarn. Stay tuned for updates on Sally’s Sweater. It’s How-Tuesday, or as I like to call it, How-To’s Day. (Yes, I know it’s like The Oneders. Go with it.) My topic is…gasp…getting gauge. I know what you’re thinking. You either gauge nothing or everything. You have this wonderful yarn that your hands are itching to work into that amazing pattern. How could you be expected to wait while you check gauge? That is, of course, if you’re not one of those asking what is gauge anyway? Gauge is simply how many stitches per inch in your project. The pattern will generally tell you how many stitches per inch you should have. Simply grab the yarn, grab your needles or hook, and cast on. Gauge is usually measured on a 4 inch square. I usually aim to make a 6 inch square, and, when knitting, I take it off my needle when I measure it since the needle can stretch your swatch. If the swatch is the wrong size, try the next size up or down in your hook or needle. If you’re one of those who gauge everything, you probably learned the hard way that being off gauge one stitch (or even one quarter of a stitch) either way can mean your sweater doesn’t fit. Unless you use the same pattern, yarn, and needles every time, you need to check your gauge if fit is important. This is because the pattern, the yarn, and the needles all affect gauge. So does your mental attitude, distractions such as TV and kids, and even how much coffee (or wine) you’ve had. So, what do you do if you can’t wait to start your project? Usually when I’m finishing up on one project and dreaming of the next, I’ll start a swatch when I can do some brainless knitting. 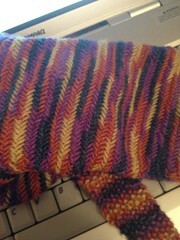 I’ve swatched at ballgames, during TV shows (like NCIS) that put my regular knitting at risk of frogging, even at church. Making my gauge swatch before I’m ready to start the project usually prevents the temptation of starting without making a gauge swatch. One reward of a swatch, especially if you’re unfamiliar with the yarn in your project, it gives you a chance to see how the yarn works up. Sometimes a yarn looks yummy in the skein, but when you knit it the drape is wrong, the colors pool oddly, or you just don’t like how it works out. Working a swatch gives you a chance to see a new yarn in action. It’s well worth the time you put in if it saves you from frogging a project later. 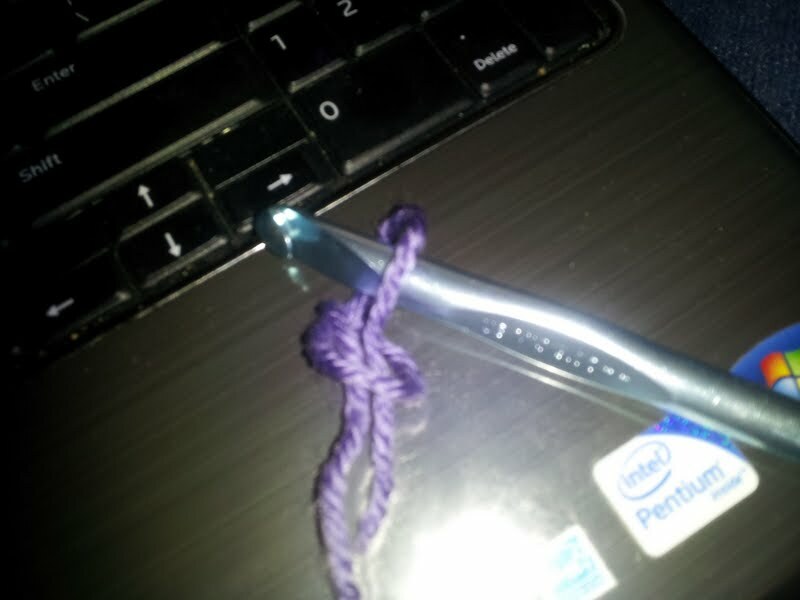 When picking up the crochet hooks again, after many years, one of the hardest thing for me to relearn was how to start the initial loop to start my chain. 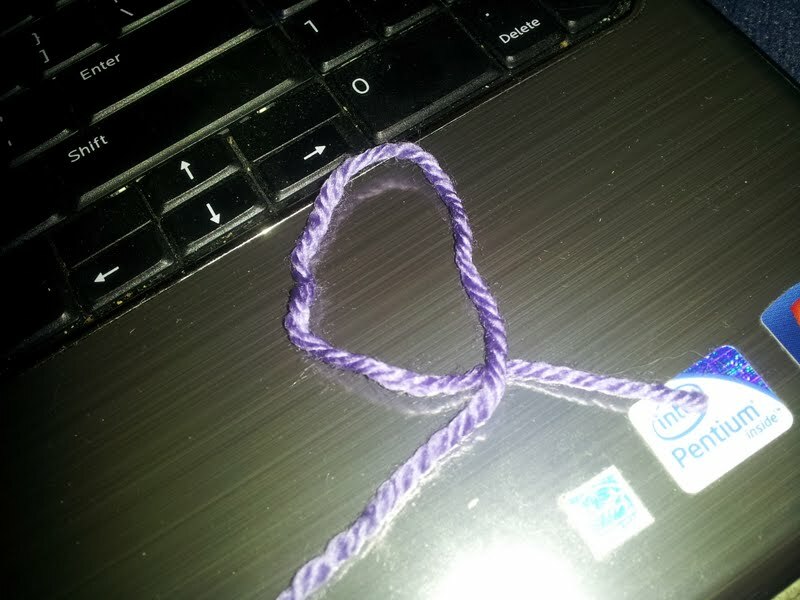 I attempted intricate knots, multiple wrapping of the yarn around the hook, etc. I knew it just had to be easier. 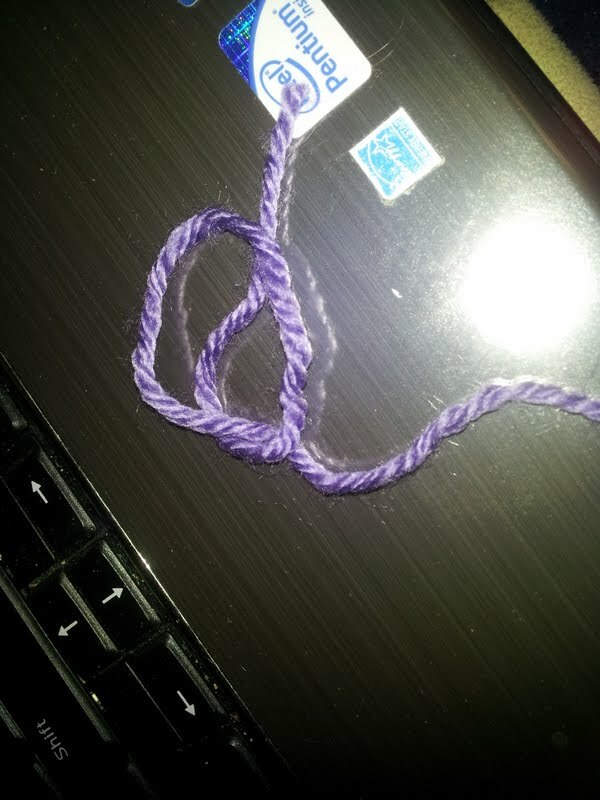 One day the end of the string was just laying on the table in such a way that a new way to start the chain struck me. (I have since learned that this is a common way). It is March and that means it’s National Crafting Month! To celebrate this wonderful month, (an additional Christmas for all us crafters, right?) we will be adding a new line of posts to the blog. Every Tuesday this month, Wired Yarn will take time to show you how to do a little something crafty and fun! Also, Sandy and I are very excited to be hosting our first event this month! On March 15th, you just MUST come to Camelot Cellars Winery in Columbus’ Short North for Yarn Swap. ever seem to find the right project for. It’s time to swap it! – You bring that skein/ball of yarn you’ve had laying around forever and just can’t find the right project for to Camelot Cellars on March 15th. – When you arrive, you place your ball in a bag and write the name of the color on the outside. The Yarn Swap will benefit Nationwide Children’s Hospital. 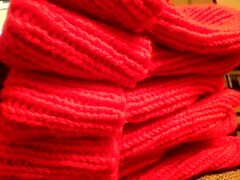 Bring in an already completed knitted or crocheted item to distribute to those in need. There will be 3 raffle prizes. Bringing in your ball of yarn will get you one raffle ticket. A donation to Nationwide Children’s Hospital will get you another. The winners will be announced at 8PM. You must be present to win! Invite your friends! Hope to see you there. Very excited to write this first Wired Yarn post. When thinking of which project to share as my first one, it was simple. For any Firefly fan, you automatically know what I’m talking about. Due to the nature of me wanting to reproduce the hat as close to the real thing as possible, I decided to actually follow the pattern (a first for me) and not just do my own thing. This was the first time I experienced using stitch markers. I used old wine glass charms as markers. They pull double duty quite well. there’s quite a bit of give in the hat. 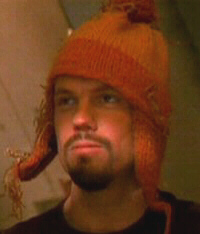 This is me wearing Jayne’s hat before finishing touches. I learned to ensure my gauge is good before proceeding with a project. Especially when it has to fit well. Unfortunately, I do not yet have a finished photo of this project since, when finishing it, I ripped out an ear flap. 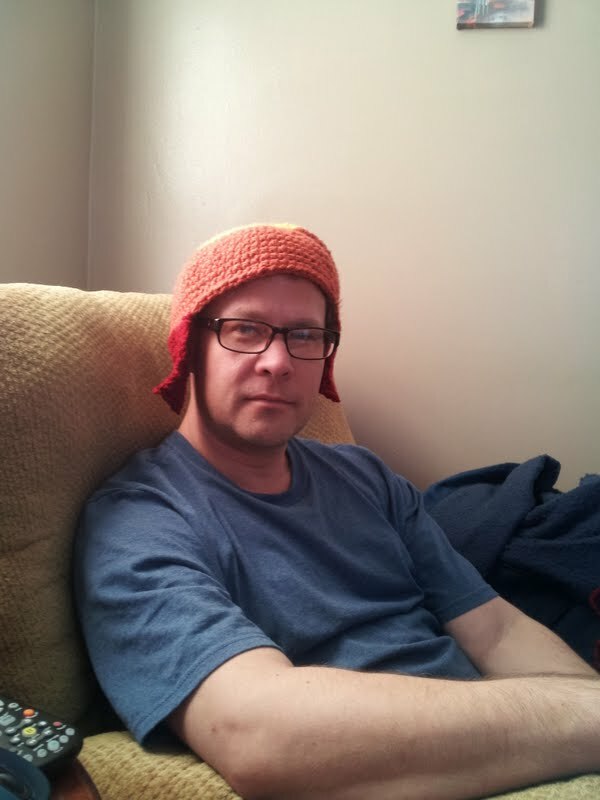 I have promised my BIL that he’ll still get his Jayne’s Hat, but it has currently gone on the back burner of projects. If you’ve found yourself here, reading this, then you are most likely wondering what the heck Sandy and Rick are doing now? We have had so much fun sharing coffee on random weekday mornings, talking about such things as NCIS, Doctor Who, Torchwood, Trek, (this list really goes on and on). Often you’ll see Sandy pull out her latest knitting project (Rick has on occasion as well). There’s always a cell phone or two involved (for tweeting, of course). Usually, the Nooks come out. Yes, we’ve decided to share this fun with all of you. There’s just too much of it to keep to ourselves. We want to take our love (read – obsession) with our geekdoms and show you how our minds warp… er… translate, that into yarn and craft projects. Did you see that scarf in the latest Sherlock Holmes movie? So did we, and we are on the hunt to create it ourselves. Do you love the sweater that Sally wears in Being Human? Yeah, that’s our newest search to find how to do it as well! You get the idea. As you see, there’s more to our morning coffee mayhem than just Tweets. Stay tuned for the mayhem to ensue.